Pastor Danny Lucien has led Fostoria Church of God since June 2014. He has great enthusiasm for our church and for Fostoria. Pastor Danny has a Masters degree in Pastoral Leadership, which enables him to empower people in their journey toward becoming a disciple. His passion is to see the spiritual transformation in others as they grow in Christ. Pastor Danny shares his visionary approach in leading the church. He speaks with an emphasis on the word of God, and allows the Holy Spirit to guide him. Pastor Danny is accompanied by his wife, First Lady Jenni. They continue on with twenty years of marriage and twenty years of being in the ministry. They have three beautiful daughters, all actively involved in the youth ministry. Jenni especially loves the children as she leads the Mission Discovery Kids Church. Also, her kindred spirit allows her to help women discover their identity in Christ. Together they share with the church a vision of “Loving God, Loving People, and Loving the Mission”. Pastor Danny and First Lady Jenni are a reflection of their faith and trust in the Word of God in all they do. It can be seen in their message, their vision, their outreach and their love. They have a compassion for our church and its members and a desire for spiritual growth for the community of Fostoria. We are Randy and Paula Correll and have lived in Kansas, Ohio for over forty years. We graduated from Lakota High school, were married, and had four children. I entered into factory work and am now retired. After many years as a homemaker, Paula gained her degree from the University of Findlay and is currently teaching as a senior high school math teacher with Tiffin City Schools. We both received Christ in our early 20’s and soon after received the baptism of the Holy Spirit. We served the Lord and his people in many different capacities. My first experiences were assisting with inmate Bible studies at the Sandusky County Correctional facility in Fremont and subsequently at the Marion prison in Marion, Ohio. Paula has taught Sunday school, vacation Bible school, and has taught at Christian schools as well. We have served as youth leaders, have served in young married couples ministries, and have taught foundational Bible training classes for new converts. We have been active in evangelistic campaigns as worship leaders and in preaching weekend revivals. We served with three pastors as assistant pastors and as lead pastors at a Foursquare Church in Bowling Green, Ohio for over eight years. 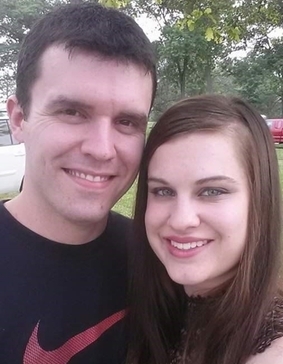 We are Oyama and Carri Bishop: together, we lead the Hospitality services at Fostoria Church of God. We have been together for 10 years; married for 6 years. We have a blended family of 6 girls. Our life, now as we know it, is a true testimony of God’s glory! ​My name is Chad Jackson. I have been a part of Fostoria Church of God for a year and currently serve as the Youth Leader. I also serve on the worship team playing the guitar. My heart is in servant leadership and seeing others built up in the body of Christ. I love seeing others grow in their relationship with God and becoming disciples of Jesus. As the Youth Leader, I believe in teaching them God’s Word and modeling it before them. My desire is to see teenagers growing in an atmosphere of God’s love while building lasting relationships with one another. ​My name is Abigail Lucien. My position here at Fostoria Church of God is to serving on the worship team as music minister and being the youth leader to a wonderful group of pre-teens and teenagers ages 12-18. Nearly 5 years ago, I found myself at Lee University pursuing the call of music. There I had the opportunity to sing in Ladies of Lee and Campus Choir, two amazing choirs that stretched my character and vocal technique in new ways. My years of study also included church music which enhanced my ideas behind worship technique and congregational song. This prepared me for the unseen journey of being uprooted and planted in Fostoria. This past year, God called my family to serve the people of Fostoria. Being in ministry is something that has always been in our hearts and is exciting to walk out together in the present. Serving together has allowed me personally to put on many hats which is what led me into youth ministry. Being in youth ministry has changed my life. I have developed such a strong love for the teens here in Fostoria. They are my heartbeat and seeing them grow in Christ and being his image to their peers is something to look out for! They are the future of Fostoria and will do amazing things for God. Along with serving our youth, ministering in Fostoria has also allowed me to answer the call of leading worship. As minister of music, it is my intent to better serve our worship team by creating a structured, well-equipped, and unified setting to worship on Sunday mornings and evenings. This call to service has allowed me to work with beautiful people over the past many months. Every week we come together in one of the most intimate connections we can have with God through song. I’m looking forward to seeing how intimate we grow in God and with each other through the beauty of song in singing praises to his name! “Let everything that breathes sing praises to the Lord” Psalm 150:6.